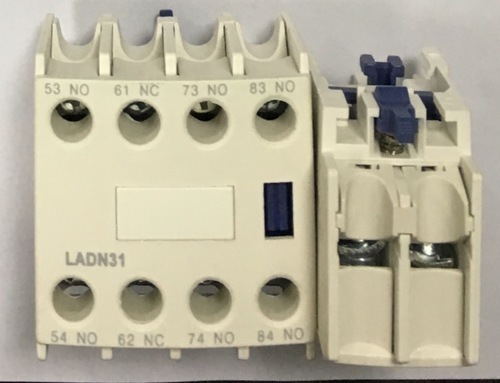 LA1-D Contact Blocks auxiliary contact blocks are installed at the top of CA2-D control relay or LC1- D AC contactor for expanding the couples of auxiliary contacts points, owning to adopting the contacting functions of sliding friction, the item can be self-cleaning ensure the electric circuit to be reliable. Moreover, we provide uttermost convincement of timely delivery of our components. Since our establishment i.e 2010, we, "Sibass Electric Private Limited", are engaged in providing our clients with a comprehensive range of electrical components like Control Gear, Automotion Products, Industrial Sockets, Cable Drum, Crimping Tools, Industrial Connectors. We deal all these products using high grade raw material that is procured from reliable and certified vendors of the market. These products are widely appreciated by the clients due to their durability, reliability, excellent performance and low maintenance. All our products are designed in accordance with international quality standards and norms. Our team of expert professionals helps us in wining the trust and confidence of our clients by providing them with a range of products as per their requirements. It also contacts our clients on regular basis for comprehending their ever-growing demands in a better way. The meticulous efforts of our team have helped us in garnering a huge clientele.